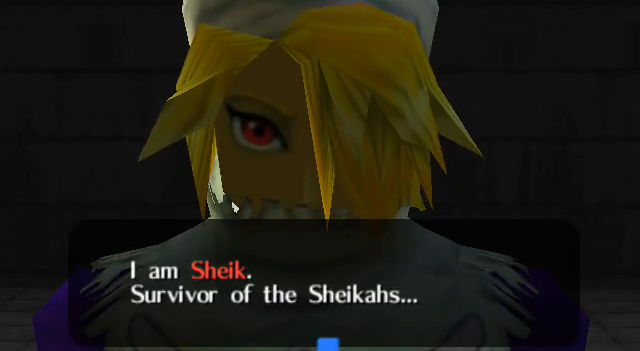 So I've been trying to think back to my days playing Ocarina of Time, trying to analyze in my head how some characters were and behaved for something I've been trying to write. 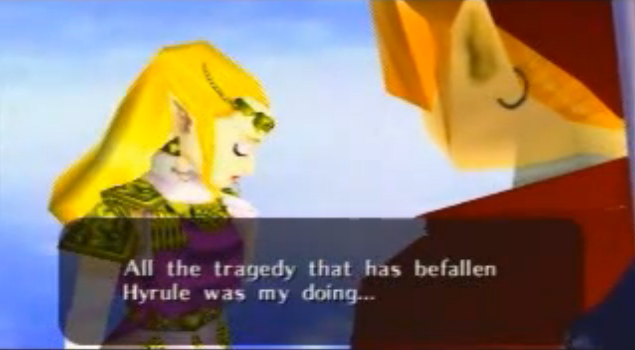 Zelda came to mind, specifically about how her miscalculations and missteps (along with Link's) result in the dark timeline where Ganondorf reigns as a King of Evil. Zelda intrusts you with the task of seeking out the spiritual stones to obtain the master sword in order to stop Ganondorf, right? And when all that business falls to pieces, she intrusts Link with the Ocarina of Time and ends up opening the gate of time for Ganondorf while losing seven years of his life in the process. Not only that, Link is then forced to clean up the mess that he and Zelda created by letting Ganondorf get an opening to the Triforce. Now I know that all the devastation wasn't caused directly by Link or Zelda but they both have a huge responsibility when it comes to taking care of the mess since they did play their parts in creating this timeline. So to get to the main question, what does that make for Zelda's character? What kind of person is she in the context of the game's story? She shows some elements of being apologetic when all is said and done but I've never really been able to put my finger on the issue entirely. I'm hoping other opinions on her character might illuminate some ideas for me. Edited by Game Master JRPomazon, 20 July 2013 - 01:13 AM. It's all supposed to be indicative of the kind of character needed to use the Triforce justly and effectively. Specifically, Ocarina of Time is vaguely structured like a coming of age story, and her flaws are supposed to show her immaturity and irresponsibility. I think I made some posts on this on ZU in the past, lemme see if I can dig them up. Edit: Okay, it appears I only made one post to that effect and, lol, it's not that in-depth and isn't really about Zelda. Here it is, anyway. Time and growth is a pretty prominent theme during all the temple storylines. The Forest Temple is about loss and nostalgia, the Fire Temple is about friendship deepening over time, the Water Temple is kind of a blend of the two, but about romance rather than friendship, and the sense of loss is more from Ruto's point of view. The Shadow and Spirit Temples were pretty nicely summed up by the posters above. The theme of growth and maturity is a major part of the game as a whole, of course. Though we are told that the Triforce split in Ganon's hand because he was found not to possess a balance of the three virtues, I think Zelda's later comments on Ganondorf and herself hint at what it means, symbolically, to lack this balance. I like to think that the Triforce mark on the back of Link's hand in the ending is supposed to symbolise that Link has acquired - or is on the path to acquiring - the necessary experience and maturity. Edited by Fin, 20 July 2013 - 05:39 AM. 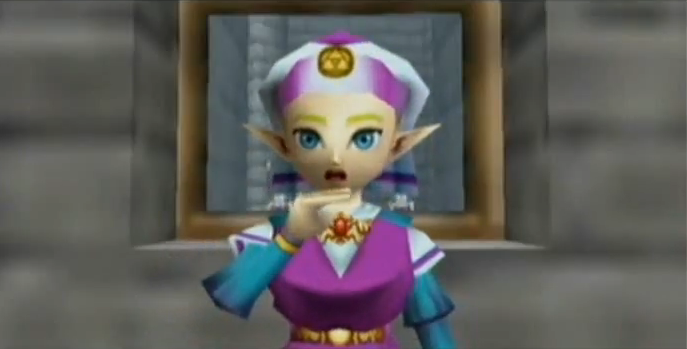 As a child, Zelda is incredibly frightened. She has prophetic dreams and senses evil in a man that is trusted by her father. When she tries to warn the adults around her, they don't believe her. 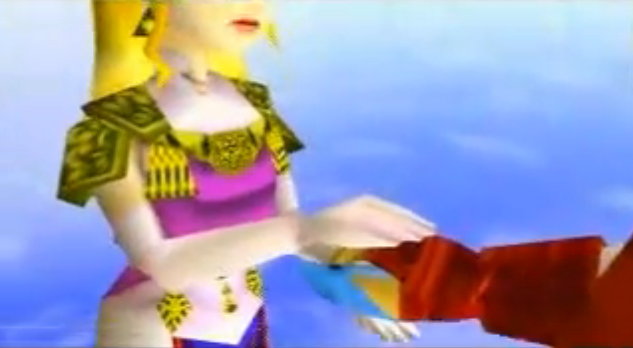 When she meets Link, she recognizes him as the heroic figure from her dreams which gives her hope. 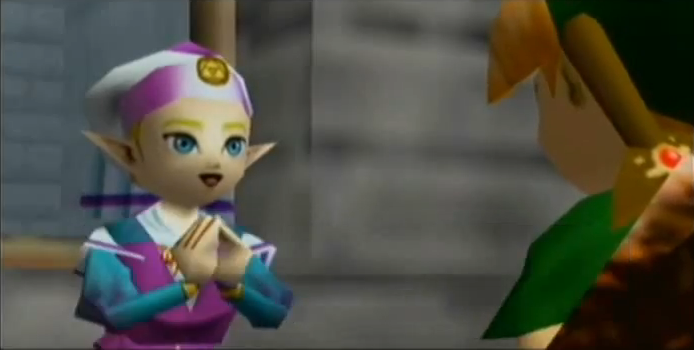 So much hope that she can barely contain how excited she is, and goes all out with their "secret plan" to get to the Sacred Realm and obtain the Triforce. What she doesn't realize is that's exactly what Ganondorf wants them to do: in fact, he's already caused problems for the owners of the Spiritual Stones specifically so that Link will solve them and get the Stones. Link and Zelda were naive children and Ganondorf took advantage of that to trick them into opening the seal to the Sacred Realm. 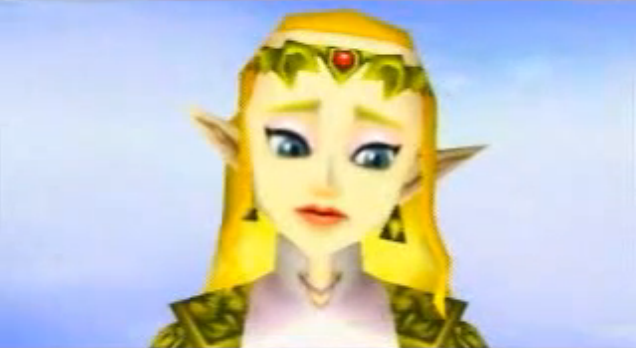 After Ganondorf is defeated is when Zelda reveals her regrets to Link. 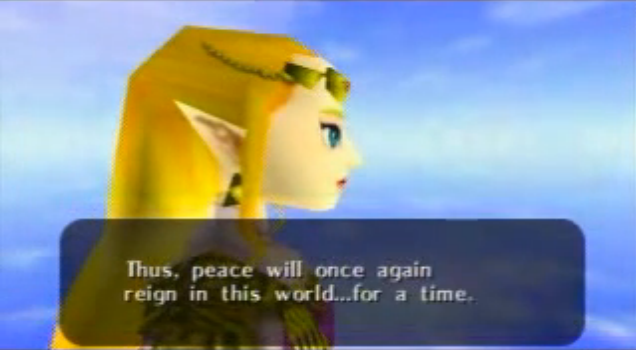 We can see her mixed feelings in the scene: She is relieved that Ganondorf's reign is finally over and that Hyrule will be at peace once again. But she can hardly feel victorious, because she feels incredibly sorry for being partly responsible in the first place, and for robbing Link of his childhood. So she sends him back in time, along with instructing him to seal the path between times, shutting her timeline off from his. It's hard for her to do because she has developed a strong bond with him and she will never see him again. We can assume that she continues mourning her regrets after Link is sent back because she is nowhere to be seen with the citizens of Hyrule nor the Sages as they celebrate Ganondorf's defeat. 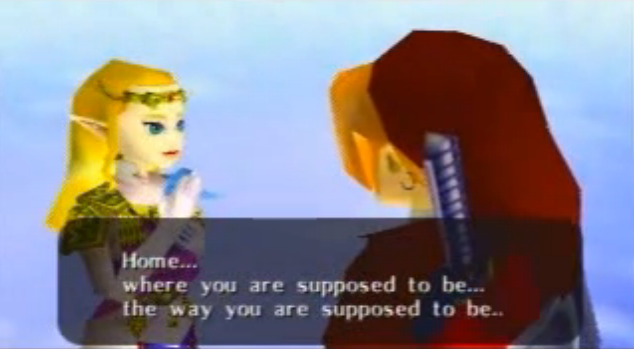 Fear: Caused by the prophetic dreams, Ganondorf's presence in the castle, and nobody believing her.